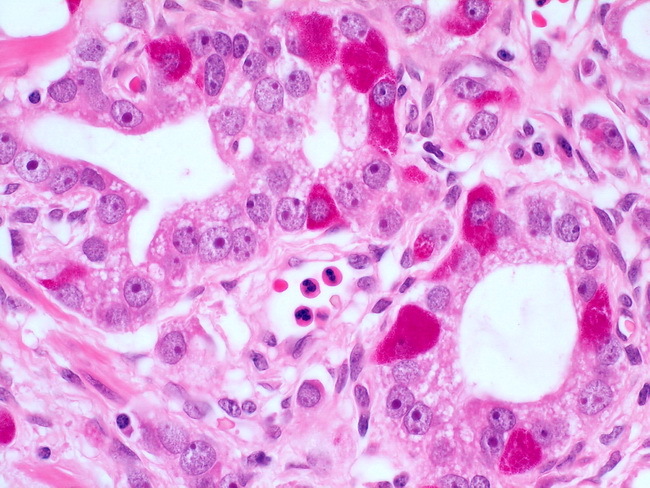 When evaluated with immunohistochemical markers, neuroendocrine differentiation is seen in a high proportion of prostatic adenocarcinomas (between 30% to 100%). In about 10% of cases, it can be recognized on routine H&E stains due to the presence of large eosinophilic granules in the cytoplasm. Although these cells resemble Paneth cells of small intestine, they lack lysozyme activity. Majority of such cells stain with antibodies to serotonin and chromogranin. A variety of other neuroendocrine markers have been detected in numerous studies.